Here’s a paradox to ponder: Rain falling on a permanently arid landscape refreshes and encourages life, right? Not always. Until three years ago, the hyperarid core of Chile’s Atacama desert — the location of the driest point on Earth and an important analog for Mars research — had not seen substantial rainfalls in 500 years. Now sudden precipitation thought to be caused by global climate change has done unexpected damage to the microbes that live in this rare ecosystem, which are uniquely adapted to the hyperarid environment. What does this mean, and why is it important? We asked TED Fellow and astrobiologist Armando Azua-Bustos of the Centre for Astrobiology in Madrid, Spain, to fill us in on his findings. Never-before-seen lagoons created by recent freak storms in Chile’s Atacama Desert have killed a majority of its soils’ microbial life. This photo was taken after rains in 2017. All images courtesy of Armando Azua-Bustos. First, fill us in about the characteristics of the Atacama, and why it’s associated with Mars? The Atacama Desert, located in northern Chile, is the driest and oldest desert on Earth. It has been an arid place for the last 150 million years, and an extremely dry place for the last 15 million years. By definition, a ‘‘desert’’ is a region that receives extremely low rains, far less than the amount required to support the growth of most plants. The majority of Earth’s deserts have average annual rains of less than 400 mm per year. This is the case, for example, in the Mojave Desert, which receives 330mm of rain per year. In turn, ‘‘true deserts’’ like the Gobi and the Sahara receive less than 250mm of rain per year. The special category of ‘‘hyperarid’’ is assigned to those extremely arid deserts like the Atacama, where the rate of water loss in an environment is much higher than the rate of input. 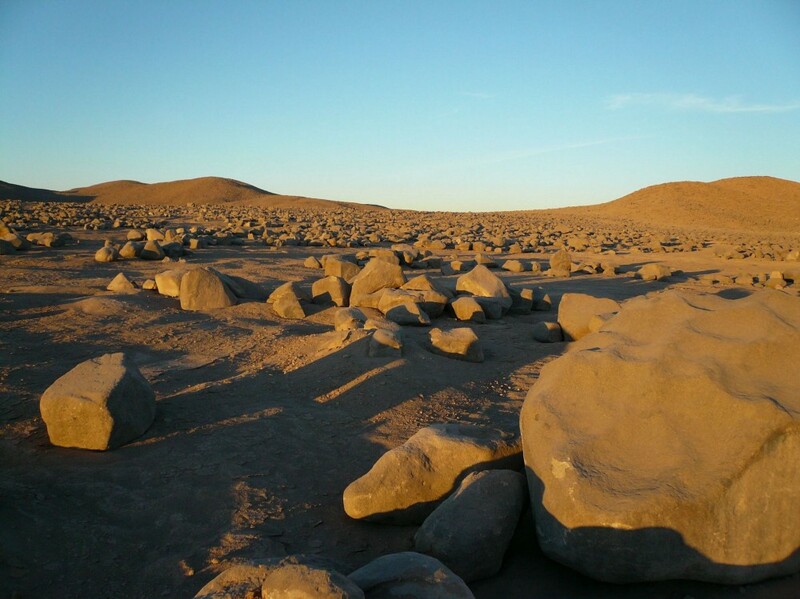 Most of the hyperarid core of the Atacama normally receives less than 2 mm of rain per year, and has spots where it has not rained for centuries. This lack of moisture is why it’s considered a useful Mars analog. María Elena South, the driest place on Earth. The hyperarid core of the Atacama is considered an important analog for studying Mars because of its extremely low moisture levels and soil composition. Your initial research discovered microbes living in place that’s otherwise devoid of life. Can you tell us how you discovered them? In 2015, my colleagues and I identified María Elena South as the driest site within the Atacama desert, and thus, the driest place on Earth. At that time, we were searching for the dry limit for life on Earth — essentially a place so dry that, theoretically, nothing would be able to live in it. Before our findings, the Yungay region of the Atacama, about 200 kilometers away from María Elena South, had been considered the world’s driest spot. Even in these extremely arid places, there is a little bit of life. Previous research done in the Yungay had identified 16 forms of microbial life, and in the even drier María Elena South, we found three types of bacteria. These bacteria are adapted to extremely low water availability, as well as to highly saline soils and high solar radiation. We discovered these microorganisms by extracting DNA directly from the soils we were studying, and from this DNA we amplified and sequenced genes that are regularly used to identify microbial life. We were also able to grow some of these microorganisms, identifying them using a similar protocol. Because the Atacama is as dry as Mars and has similar soil makeup, the discovery of viable microbes also suggests that Mars’ extreme dryness doesn’t necessarily mean there’s no life in the red planet. When did you first notice that water was collecting in the Atacama, and what prompted you to test the waters to check on the region’s microbial life? We first had a hint of what was going on in 2015. On that occasion, we were driving through the middle of the hyperarid core when we noticed several lagoons — from 4-by-1 meters to 60-by-40 meters in size — beside the road in several spots, separated by several miles. Intrigued, we stopped and took pictures, thinking they were the result of human activity nearby, as there are many mines — copper, nitrates, lithium — in the area. It wasn’t until 2017 that we observed this same phenomenon again in the Yungay. Consulting the experts at the Chilean Meteorological Service, we learned that both the 2015 and 2017 lagoons were created by highly unusual rain events on March 25 and August 9, 2015, and June 7, 2017. These rains were unusual not just in the amount of water falling on the normally hyperarid core of the Atacama, but because of the direction of cloud movement and the extent of the area affected. A little moisture is known to enter the Atacama at its eastern edge where the foothills of the Andes begin, as summer air masses coming from the Amazonian basin are able to go over the Andes mountains. However, in the 2015 and 2017 events, huge masses of clouds came from the west from over the Pacific — a never-before reported phenomenon. This covered the entire hyperarid core of the Atacama with rains, to the point of creating lagoons that look utterly surreal in such an extremely arid environment. Scientists look for remaining signs of life in the Atacama in the aftermath of climate-change induced rains. What had you expected to see, and what did you find instead? At first, I thought that if water was suddenly freely available in this extremely dry ecosystem, there would be an explosion of life. But to my surprise, when I inspected the water of three of these lagoons with a microscope, I could not see anything. We had to extract DNA directly from these lagoons and cultivate the water in different growing media. Even when we did that, we found only four types of bacteria that were able to live in the water — a number that had fallen from the 16 that had been logged by previous researchers over the years. It turns out that if a lot of water is suddenly added to this kind of microbial ecosystem, it rapidly kills most of the bacteria present in these soils as they their systems are exquisitely adapted to extracting moisture from arid environments, and can’t cope with new watery conditions. The water had penetrated the cells’ membranes, inflating the bacteria like balloons and forcing them to burst — a process known as “osmotic shock” — spreading their contents into the surrounding environment. Why is this discovery important news for science, for humanity? What are some of the possible implications for the Atacama’s ecosystem? We’re still uncertain how wide-ranging the effect of water will be on biodiversity for the entire hyperarid core of the Atacama, but we must consider the possible loss of these potentially useful, very unique bacteria. For example, we’ve found that other bacteria that inhabit these extremely dry places belong to the genus Streptomyces, well known for producing antibiotics. Who knows what critical genes useful for humanity we may be losing? Our study has also shown us how fragile the Atacama’s ecosystems are. They live at the brink of survival. This is a sobering message about how climate change might affect all our ecosystems in completely unexpected ways. Scientists testing the waters of lagoons caused by unusual rains discovered mass extinctions of microbes that had been uniquely adapted to survive in hyperarid conditions.